Boutique Collection 3-in-1 Wood High Chair - Bella Teddy is rated 5.0 out of 5 by 23. Designed with parenthood in mind.™ Ingenuity's™ 3-in-1 Wood High Chair™ is every chair baby will need, because it's three chairs in one! Three modes of use include a full-size high chair, booster seat, and toddler chair. When used as a booster and toddler chair, two children can be seated at the same time. 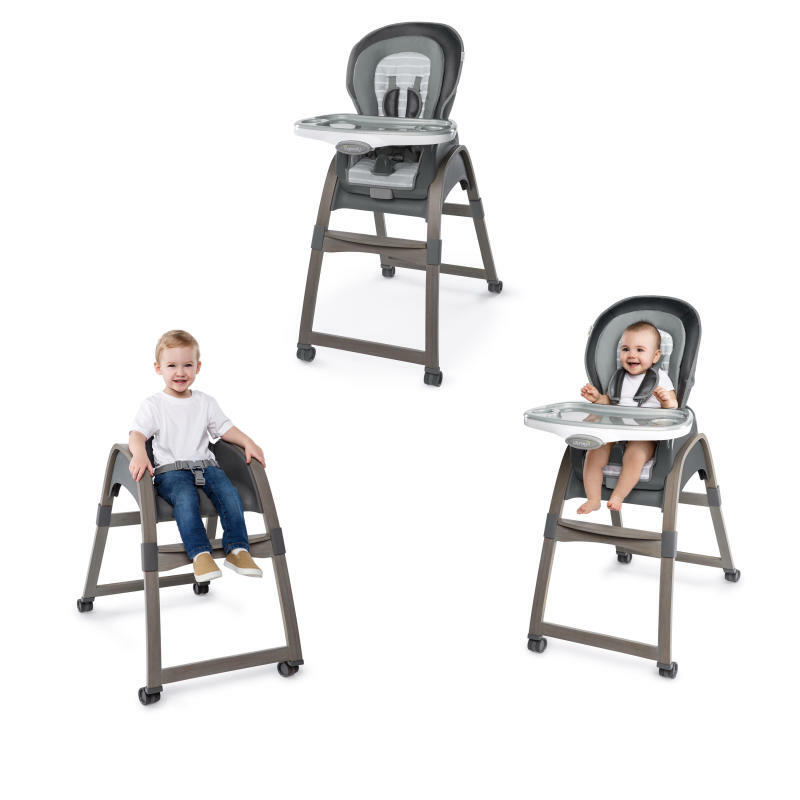 Ingenuity™ redesigned our best-selling high chair, with the contemporary and chic features of a sleek gray wood finish and neutral colors that are sure to complement the décor of most homes. The Bella Teddy™ fashion is all about the details from the premium leatherette seat pad, to the soft fabric bolster, and the leatherette harness buckle covers. The premium support cushion seat pad adds extra comfort for baby. Adjust the seat to for baby’s comfort with three different recline positions to accommodate a growing baby and toddlers up to 50 pounds. Ingenuity™ made clean ups convenient and a breeze! A baby wipe pocket is within arm’s reach on the back of the seat. The leatherette seat pad and harness buckle covers easily wipe clean. The fabric bolster and fabric harness straps easily wipe clean or can be tossed in the washing machine when things get a little messy! The EasyClean™ tray removes with one hand, is dishwasher-safe, has built-in cup holders and features four locking positions to grow with baby. Designed with safety in mind, the wood high chair and booster seat include a five-point harness and the toddler chair has a three-point harness to keep baby secure. The rolling wheels of this modern highchair allow mom to keep baby in reach and lock into place. Seat pad – Wipe Clean with a soft, clean cloth and mild soap.Tray - Dishwasher safe. Wipe clean with a soft, clean cloth and mild soap.Tray Insert - Dishwasher safe. Wipe clean with a soft, clean cloth and mild soap.Frame – Wipe the wood frame with soft, clean cloth and mild soap.Harness/Straps – Remove from frame. Machine wash with cold water, gentle cycle. No bleach. Air Dry.Bolster - Remove from frame. Machine wash with cold water, gentle cycle. No bleach. Tumble dry, low heat.Shoulder Strap Covers - Wipe clean with a soft, clean cloth and mild soap. Rated 4 out of 5 by Tiff from Great chair This is a great chair that can grow with your child we needed to remove it and use it at a family members house and was able to just strap it onto a chair. The only thing that is difficult is it's not a space saver type. Rated 5 out of 5 by Kellyhitt13 from Sturdy and Durable!! My daughter is now 5 months and has started solids. The high chair is perfect. It was very easy to set up and I love that it has a modern look to it. I wouldn’t say that it’s heavy but compared to other plastic high chairs I have used in the past the quality of the high chair is unbeatable. I also love that the material can be and plastic top can be easily whipped down after a messy baby. Overall, I am extremely happy with this high chair and I would 100% recommend it to my family and friends. Rated 5 out of 5 by Kellyhitt13 from Sturdy and Durable!! My daughter is now 5 months and has started solids. The high chair is perfect. It was very easy to set up and I love that it has a modern look to it. I wouldn't say that it's heavy but compared to other plastic high chairs I have used in the past the quality of the high chair is unbeatable. I also love that the material can be and plastic top can be easily whipped down after a messy baby. Overall, I am extremely happy with this high chair and I would 100% recommend it to my family and friends. Rated 5 out of 5 by Babysteph from Beautiful and versatile high chair! This high chair is well constructed and beautiful. We are currently using the booster portion. It attaches easily to our chairs, and our toddler loves it. The tray pops off easily for washing, and there is a convenient wipe holder on the back which we use after every meal. We are about the move our baby into the high chair, but our 20-month old even uses the wooden top portion of the booster as a chair in her playroom. We like it for this purpose because it doesn’t tip over like many of her other chairs. Overall, this chair is extremely versatile, blends nicely with modern decor, and is full of safety features that we value. Rated 5 out of 5 by Babysteph from Beautiful and versatile high chair! This high chair is well constructed and beautiful. We are currently using the booster portion. It attaches easily to our chairs, and our toddler loves it. The tray pops off easily for washing, and there is a convenient wipe holder on the back which we use after every meal. We are about the move our baby into the high chair, but our 20-month old even uses the wooden top portion of the booster as a chair in her playroom. We like it for this purpose because it doesn't tip over like many of her other chairs. Overall, this chair is extremely versatile, blends nicely with modern decor, and is full of safety features that we value. Rated 5 out of 5 by LizM08 from Love this!!! I just love how versatile this high chair is. The wood is sturdy, and the seat is plush. Cleaning the tray is easy. The chair can easily be moved around, thanks to the wheels. I like that the chair will be able to grow with my daughter as well. Rated 5 out of 5 by Misha06 from Perfect for growing son When we received the high chair, I was surprised with how good the quality was. It wasn't bulky or heavy like I had expected, it's perfect for him. I love how you can transition it from little baby all the way up to toddler, I know my mother would also be able to easily change the sizes too. I really like the slide out, I like that there are two ways to slide the tray out. There is no confusion for anyone using it. Also that the tray has a dish washer friendly top is a bonus. The wipe storage in the back is defiantly a bonus! I like that when he has finished dinner I can quickly like him up and he can run. Rated 5 out of 5 by Nahlialeeyah from Super sleek Love the detail in this chair !!! The best part is the wipes holder . Why didn’t anyone else think of this . The fabric is nice and soft . I love how it grows with your child as well.